LOWER MANHATTAN — More than a week after a cable snapped at 4 World Trade Center and sent a massive load of steel beams plummeting 40 stories to the ground, big questions loom about what happened and why. City, state and federal investigators flooded the site in the wake of the Feb. 16 accident, but so far none have come to any conclusions about why the cable failed. The Department of Buildings, which ordinarily investigates major construction mishaps in the city, does not have its usual authority at the World Trade Center because the 16-acre site is owned by the Port Authority, a state agency. 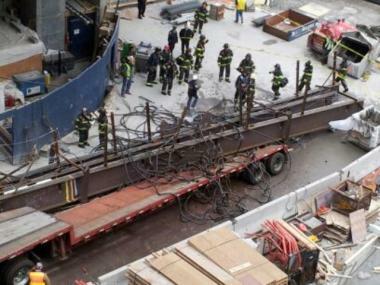 The Department of Buildings did look into the recent accident — in which the falling steel beams smashed into the back of a flatbed truck, amazingly not injuring anyone — but the city agency did not have the jurisdiction to issue any safety violations and referred the matter to the Port Authority, online records show. A crane dropped at load of metal beams on top of a truck at the WTC construction site Feb. 16, 2012. Catherine McVay Hughes, chairwoman of Community Board 1's World Trade Center Redevelopment Committee, said on Friday that she was concerned about how long the investigation was taking and the uncertainty over the roles of the many different agencies and contractors that are involved. "It's already been over a week," Hughes said. "We want to know what went wrong and what's being done to prevent it from happening again." The Buildings Department referred questions about the accident to the Port Authority, which in turn referred questions to Silverstein Properties, the private developer building 4 World Trade Center, and the Occupational Safety and Health Administration, which s spokesman was still investigating as of Friday afternoon. Silverstein declined to comment, as did Tishman Construction, the general Contractor at 4 World Trade Center. The crane that broke Feb. 16 was a TG-1900 tower crane made by FMC Link-Belt Construction Equipment Co., a common model that is used on many other construction sites throughout the city, sources said. At the time of the accident, the crane was reportedly lifting three 62-foot steel beams weighing about 38,000 pounds, or nearly 20 tons, in total. That should be well within the crane's capacity of 150 tons. But for some reason the crane's cable snapped and the steel crashed back down to the ground. Even though no one was hurt, the accident sparked renewed calls for clearer safety oversight at the World Trade Center site, which falls into a regulatory gray area because it is owned by the state. The Port Authority is not legally required to follow New York City building and fire codes at the World Trade Center site but has made several commitments over the years to meet or exceed the city's safety standards. In 2009, amid concerns about crane safety at other construction sites in the city, the Port Authority agreed to allow Department of Buildings inspectors onto the World Trade Center site. However, the DOB has to give the Port Authority advance notice of when it plans to inspect and must be escorted by the Port Authority at the World Trade Center site, according to a March 5, 2009, Memorandum of Understanding between the DOB and the Port Authority. In practice, when the DOB is called in to investigate a safety complaint, the agency often refers the issue back to the Port Authority, according to an online listing of complaints. State Sen. Daniel Squadron, who represents Lower Manhattan, has sponsored legislation to try to resolve the jurisdictional uncertainty at the World Trade Center and other state-owned sites. The legislation was partly in response to the many safety violations uncovered at the state-owned Deutsche Bank building after a 2007 fire there killed two firefighters. "[The Feb. 16 accident] is just another reminder that we need better processes and more clarity on the overlapping responsibilities and city and state building and fire codes," Squadron told DNAinfo on Friday. 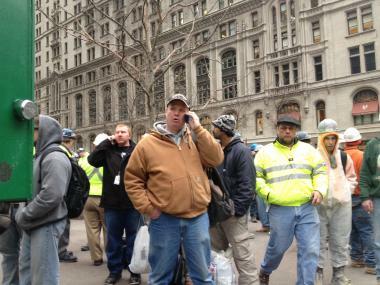 Workers at the WTC site after a crane dropped a load of steel beams on a truck Feb. 16, 2012. "The overlapping roles between city and state agencies are too often confusing." As a result of Squadron's legislation, an appointed panel will release recommendations as soon as this spring on how to improve safety at sites like the World Trade Center. Many workers at 4 World Trade Center appeared to take the Feb. 16 accident in stride and said they did not see an issue with safety oversight on the project. "It was a freak accident," said Tom Purcell, 43, shop steward with the Local 638 Steamfitters union. "That no one got hurt is the main thing." Purcell said he felt safer working at the World Trade Center than on other construction sites because there are so many different agencies overseeing it. "It's such a high-profile job," he said. But a 49-year-old construction worker on the tower, who did not give his name, said he did not think the oversight made the project safer. "They put up a big front that it's safe," the worker said, "but it's rush, rush, rush like any other job. Pretty much they're all unsafe." 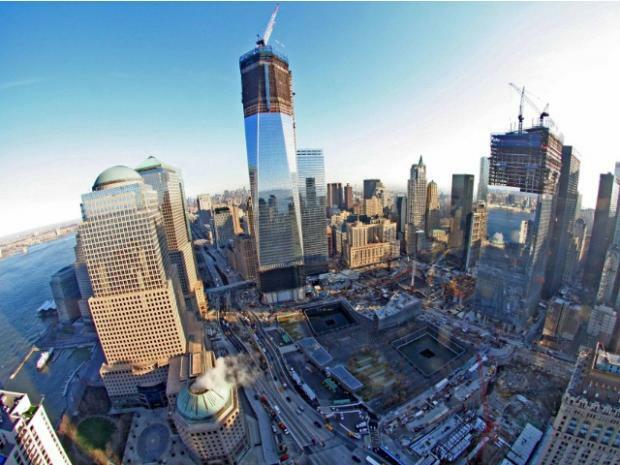 Last May, a four-foot steel rod fell from 4 World Trade Center and hit a teenager who was walking down Liberty Street. The teen's hand was hurt, but not seriously. Other recent accidents include a worker who fell 20 feet from Silverstein's 3 World Trade Center last November; a 1 World Trade Center worker who was hospitalized after a piece of metal fell on his leg last July; and a 1 World Trade Center worker who was hit in the chest with equipment last May.